Folks are tired and overloaded. They think self care is selfish. Too many roles and too little time. Where did the fun go? 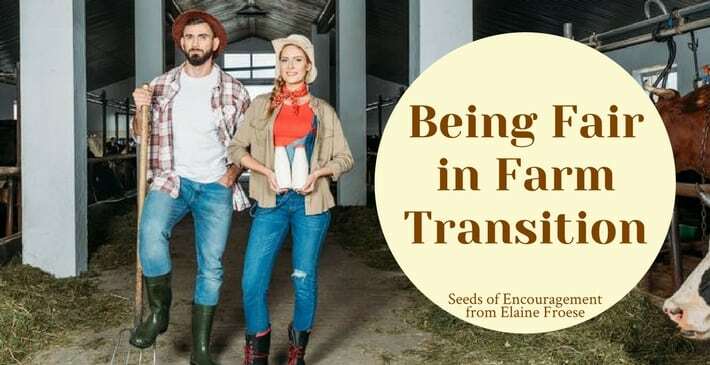 Elaine is an active farm partner with off-farm demands, just like you. She’s experienced a serious health issue, which makes her passionate and practical about being intentional, not “busy” and she shares her story and strategies for living a balanced life in this presentation. Learn to identify your 6 core roles and the passions that drive you. Decrease your demands... what needs to be dropped? Adopt energy boosters... what things give you energy? Take care of you, people are your farm business’s most important asset. Elaine Froese hates it when people say “she must be busy.” As a certified coach from the Hudson Institute of Santa Barbara, Elaine has amazing strategies for mapping out a great way to live intentionally and make conscious choices. She removed “all hurriedness from her life” after a serious bout of post-partum depression. Her empathy for mental health is widely appreciated by her audiences as she confronts the true challenge of self care which is not selfish. As a depression survivor, she places a high priority on staying healthy. Elaine has been writing and speaking about balanced living in a complex world since 1987. She knows it is never a quick fix project, but an ongoing process of choosing what is most important to you in the present season of your life. Your method of presentation was very well done as visual aids are always so much easier to follow. Your request to write down our own questions and answers challenged us to do some deeper thinking. We found your uniqueness was represented in the fact that you were able to share situations about yourself that proved that you were coming from a place that lots of us have been. Your “humanness” shone through and we could associate with you not being just a guest speaker, but one of us as well. Hire Elaine Froese to help you live an intentional, balanced life.